I don’t think that I have shared this on the blog, but about a month ago I went back to work three days a week. Now that I have to pack lunches for the three of us on the days I go to work something small started to drive me crazy. All of the little containers of food take up so much space in the lunch box! 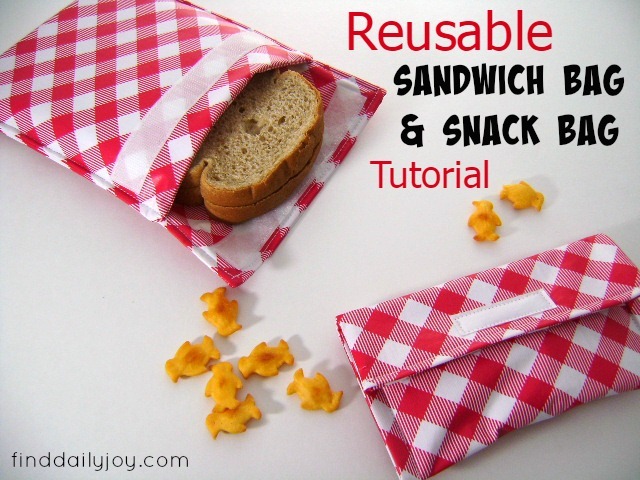 Plastic sandwich and snack bags take up a lot less space but can be pricey when you are going through several a day. I have seen reusable cloth bags several times before and decided they would be the perfect solution! 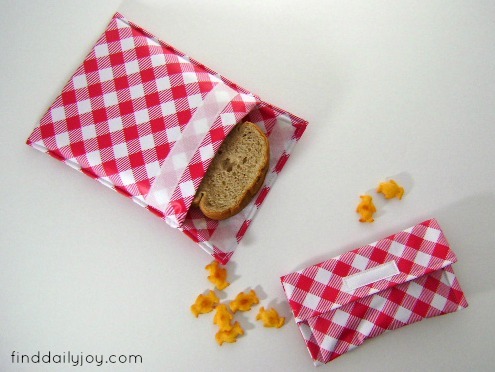 These reusable sandwich and snack bags are very easy to make and are so stinkin’ cute! 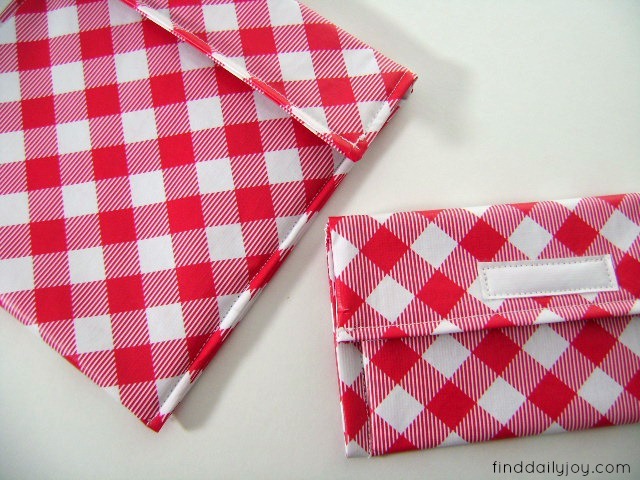 The fabric I chose has a plastic finish so it keeps dry foods dry and keeps wet foods from leaking. At the end of the day I hand wash and dry the bags right along with all of the other dishes. There are lots of different opinions about which fabrics are food safe so do some research and decide what will work best for you. Some popular fabric choices are laminated cotton, vinyl tablecloth, clear vinyl, oil cloth and cotton treated with beeswax. 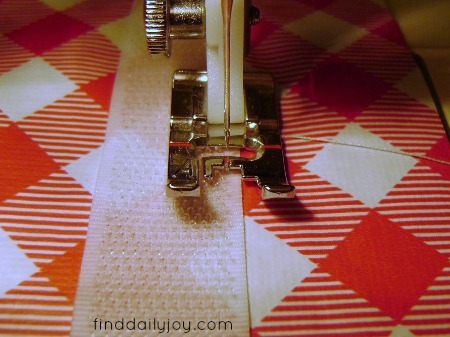 If you can sew a straight line this project is for you! So grab some supplies and lets get going. Cut out 2 pieces of fabric. 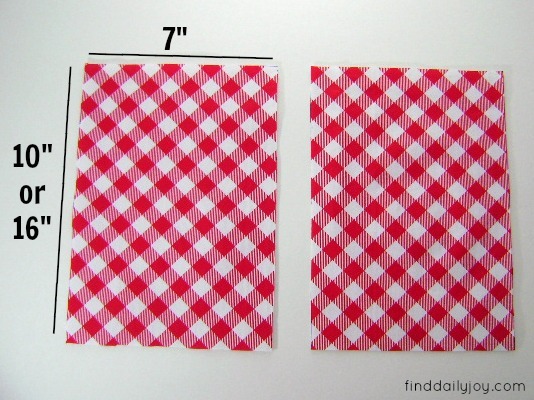 For the snack bag cut them 7″ x 10″. 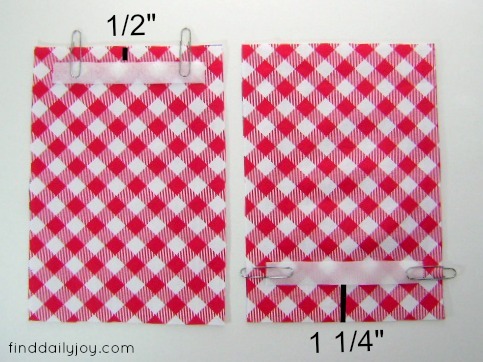 For the sandwich bag cut them 7″ x 16″. Cut a piece of Velcro 5 1/2″ long. On your first piece of fabric, center the loop (soft) piece of the Velcro 1/2″ from the edge of the top 7″ side of the fabric. 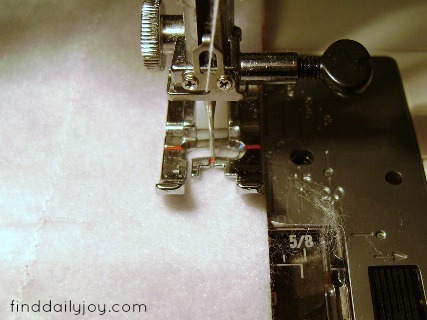 On your second piece of fabric, center the hook (scratchy) piece of the Velcro 1 1/4″ from the edge of the bottom 7″ side of the fabric. I used paperclips instead of pins to hold things together because I didn’t want to poke any unnecessary holes in my plastic coated fabric. 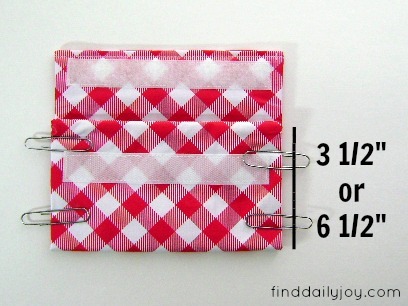 Sew all around the outside edges of your Velcro to attach it to the fabric. Place fabric right sides together with the pieces of Velcro on opposite ends from each other. 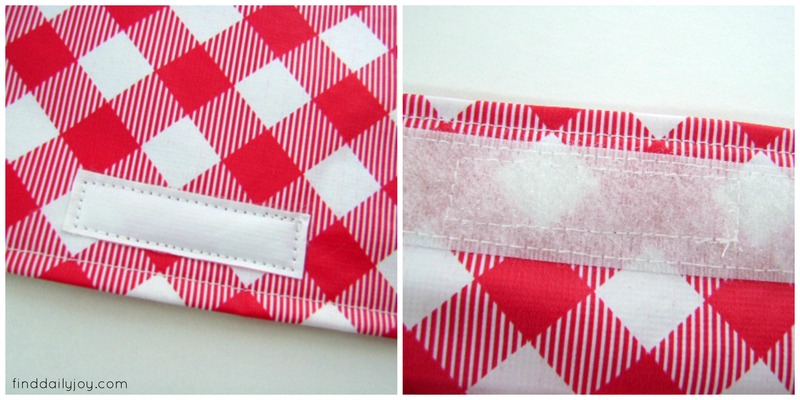 With a 1/4″ seam allowance, sew along three sides of the fabric. Do not sew the 7″ side that has the loop (soft) piece of Velcro. Then turn the bag right side out and press. If you have a plastic coated material that will melt, press the seams with your fingers rather than an iron. 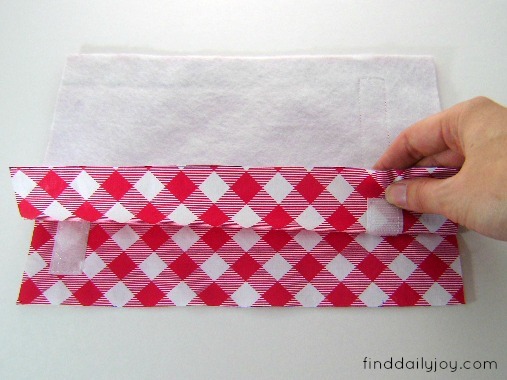 To finish sewing the fourth side of the bag, fold the raw edges under 1/4″ and top stitch 1/8″ from the edge. 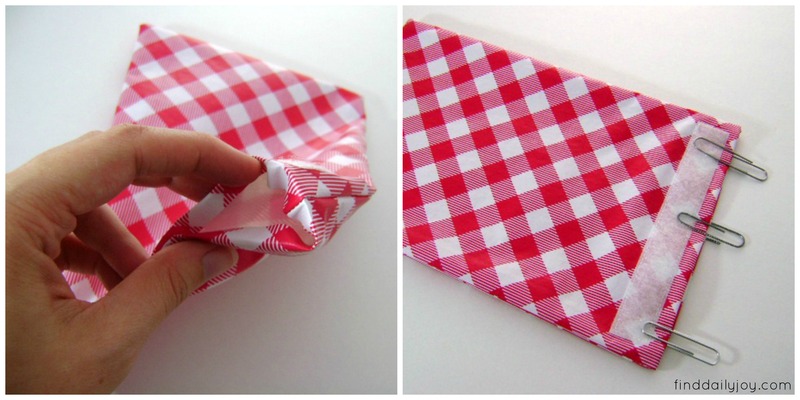 Now fold the bottom (end with the hook piece of Velcro) of the bag up so that both pieces of Velcro are facing you. 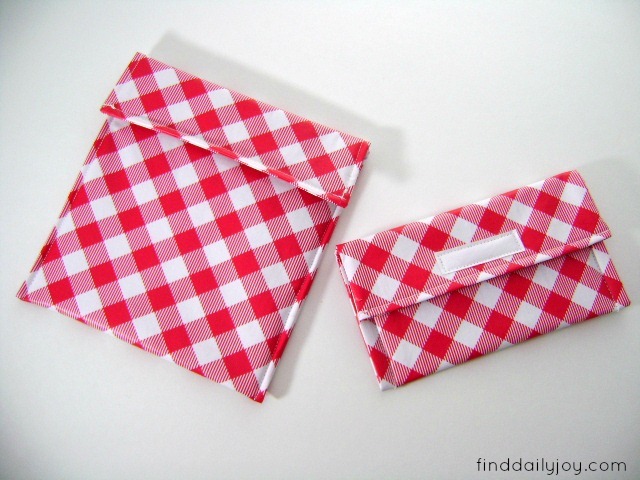 For the snack bag fold up 3 1/2″ and for the sandwich bag fold up 6 1/2″. You can see in this next picture that I tried two different ways of sewing up the sides of the bag. For my first bag (on the right) I sewed 1/4″ from the edge and didn’t sew the top flap. On the second bag (on the left) I sewed 1/8″ from the edge and sewed the entire length of the sides; including the flap that folds over. I personally like the smaller seam but go with whatever tickles your fancy. As a finishing touch I decided to add a label to my bags. Everything that goes to daycare with Henry has to have his name on it and I certainly don’t want these bags getting lost! By cutting a piece of white fabric from the salvage edge of my fabric and stitching it on the flap of the bag I now have the perfect spot to write his name. I lined the label up with the Velcro on the inside of the flap in an effort to hide the stitching. If I had been thinking ahead I would have sewn on the label when I was sewing on the Velcro. So here they are……my fun little reusable bags…..ready to transport yummy food! What A Great Idea!!!! Can’t wait to make my own!!! Thanks, I just try to take pictures every step of the way.